A facility that compounds sterile drugs may elect to register with the Food and Drug Administration (FDA) as an outsourcing facility. The registration will help the FDA identify and regulate these facilities. In addition to the FDA registration, many states are beginning to require licenses for outsourcing facilities. For example, states such as Delaware, New York, Mississippi, and Ohio have enacted specific licenses requirements for FDA registered outsourcing facilities. 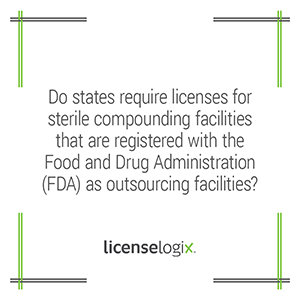 Other states have pending regulations to enact non-resident outsourcing facilities that ship compounded sterile drugs into their states to register as outsourcing facilities. Since these rule changes rely on existing federal law, pharmacies should not wait to comply with any state license requirements that may be required. LicenseLogix tracks all licensing regulations in all states for outsourcing facilities. LicenseLogix will help guide FDA registered outsourcing facilities through the changing landscape of licensing requirements and regulations. We can help you obtain all of the licenses and registrations you need, minimizing time-consuming and costly delays. To get started, contact us here or call us at (800) 292-0909.